Its quite a mess. It's a room in transition... and hopefully moving on towards a new, improved look! It can't get any worse... right? The painters have now started to apply colour and based it on the new cabinet layout, they needn't paint everything. Just where it will actually show. So that should explain the apparent 'hit and miss' paint job! There are some small patches going on as the electrician made new holes to fish more wires to where they need to go. So now that the really messy work is done, my hubby and carpenter Tom can work on the new floor. It took two days to complete as its a lot of banging and tapping hardwood boards into place. We have officially stopped removing things and now replacing them! Some weeks ago the carpet was raised and the two men 'floated' a mudding compound in the low spots to level the floor. There had been some settling near the wall that is shared by the living room fireplace. This particular weekend they first laid a layer of cushioning underlayment (that also acts as a vapour barrier) and secured it to the old floor We had 20 cases of an engineered hardwood called 'imperial walnut' and at the end we had two full cases to take back to the store. Its nice when you can actually get a refund while doing work like this for a change. The hardwood looks rich and the colour changes depending on the light and time of day. All we could go on at purchase time was the sample suspended on the flooring display and the small sample we bought and brought home. It was a rich golden brown. Since the flooring was going from kitchen and across to the dining room opposite, and with lots of light sources for the rooms, we thought we could take the darker colour! With these two pictures above you can clearly see an interesting development ... the floor has a rich red undertone. Now I'm very happy that I changed the wall colour from my lighter shade to a bolder colour called 'Brandon Beige'. The floor colour would be a challenge for anything lighter! So then on Monday morning Tom started to bring in the bases for the cabinets and lay them out on the floor. The cabinets are all made from plywood with a varnished finish. All the European drawer slides are in place. Apparently Tom has been busy building all this in January before I had even packed a box! The room was filled with the smell of fresh wood, along with a touch of fresh paint. We also had a week of dry sunny weather while all this hardware was being carried in which was really nice. The white bundles in the picture are the drawer and door fronts... we're getting closer! This is the new centre island in place. We can now access the kitchen from two points now instead of the 'U' trap we had before. Doing anything in the old kitchen meant a dance behind the counters! Keith literally made a bubble room: walls, floor ... everything was sealed off. This meant all my sewing tables, warping board area and even some yarns stash had to be shifted over and clear the space. There literally isn't one room in my home that isn't upside down and looking like a thorough search has happened! I gave the area a good vacuum anyhow (dust happens) and set things back up. This is the warping/ winding section and I have added a new floor lamp nearby. You can't have enough light! I took advantage of the situation to reorganise the stash, sewing area. It looks neater and more thought out now. Well, its the best it can be for now! So we still have a lot of work to do: stairwell, finish off the kitchen, paint hall closet, new patio doors, new front and back door.... yada yada yada! But we took a large bite of the elephant! Next time... more finishing work in the kitchen....and I'm nearing the end of my 'sanity' warp! You may have read here previously that we are undergoing renovations in our home, but I haven't really fully expanded on what is going on. Since I have run out of weaving topics to share with you, its time has come! I have been weaving....in fact that 'simple to treadle' towel project has been great! Some days I literally had no where to go in my own home and so retreated to the loom, plugged in the iPod and have been plugging away on my towels. I'm down to the last one, maybe two towels to weave off and I'm already thinking on what's next... The towels and future project will be discussed at another post. I do try to keep to my chosen topic of weaving but this is what is happening in my life right now and there is no escaping its influence right now! The renovation posts will most likely cover two or three entries for now and some updates down the road. There are a number of pictures as they tell the story best. *delayed for a week or so*: painting our living room. *to come*: three new patio doors, new front door, new back door. We started with taking down the glass cupboard and the change was amazing! It opened the whole space right up and gave us a hint of what was to come. I packed up the contents and piled it up in the guest room, and wondered how this was going to work with us living here during the process? Particularly me as I'm home all the time. Finally the day arrived and Keith and Clay started to take things apart. You can see some nasty 1970's lino which was found under the hardwood floor. It went nicely with the bright orange counter top and I somehow can imagine the appliances being a lovely avocado green for contrast. Yuck! I didn't like it the first time through the 70's! There are so many different parts to the various projects that I have decided to focus on the two skylights from start to finish. Here is the one above the kitchen and it had a florescent light box all around the opening. It was the main light in the kitchen and left the far corner dark. Here the box frame and lights have come down and drywall repairs are under way. New wire for new lights has been pulled and you can see some of the new pot lights in place. I don't know who made a bigger mess! The electrician or the dry waller/ painters. They kept me busy every night for one to two hours vacuuming.... *everywhere*! Here the same skylight is close to being finished. All it needs is re-stippling of the ceiling texture. Okay, skylight number two is over the dining room area. It was lined with cedar boards. It felt like there was a heavy weight above you when you sat at the table. We debated what to do. Paint it white? Replace the bottom trim with something newer? Remove it and drywall? The latter won! Here Clay is starting to strip it down. You can see the electrician left me a very classy bare light bulb ! When they left for the day, this is what I found. Turns out that from back when the house was first built in 1979 there were a light circle of insulation but not really secure. In fact some had fallen over and the vapour barrier didn't seal the area and was open 3 inches all around the bottom. Clay went up into the attic with R40 batts and sealed it up tight. Then up went the new drywall. Here it has had the tape joins applied with mud and the new edges done with corner bead. It needs primer and paint, then re-stippling of the texture.. You can also see the new colour for the kitchen dining room here as well. Meanwhile back in the kitchen ( and a bit back in time) I had been trying valiantly to strip off the old wall paper only to find that there was *MORE* wall paper underneath! It actually looked nicer than what was on top. I have actually seen a commercial on TV for our local electricity company and the 'new' home has wall paper in the same pattern but green! This paper must be over 25 to 30 years old. It was also on for good! The painter floated a layer of dry wall mud over it and sealed it away for who knows how many more years as a 'time capsule'. So this last picture for this time (if you are still with me :) shows a stripped down room that looks pretty darn ugly. I had to put a good spin on things and concentrated on how much more light and room there seemed to be now with all the dark wood gone. How open the space was. The plumbing is in place now and most of the lighting and electrical is done or the wires waiting for the next phase. Even though the new kitchen is something I really want to see happen, I have found this part quite distressing, messy and down right confusing some days. Its a process where you reduce the room down to it bare, unattractive bones and then start to build it back up. I'm one of those people who like to keep the home front calm and neat...so I have some *frazzled* nerves at this point. I was even called cranky one day! Me???! Meals? breakfast is cold cereal and coffee made in the bathroom. I am NOT going with out my coffee! Lunch happened when ever things went quiet upstairs and I'd make a dash for the fridge. Instant cup a soup's are handy (but awful) and cheese buns quick. Dinner was (and still is) a medley of local dining. We reckon that the cost of not buying groceries helps offset the cost of restaurant dining. Okay, we're kidding ourselves but we actually needed a daily break from the house each day. Part 2 next time with more pictures... and maybe even some weaving? Right now I have no kitchen, and for a time, not even the studio is accessible as they do repairs to the ceiling. I scurry from room to room with painters and electricians flushing me out like a grouse, moving me on! My laptop computer is wi-fi so I carry it around the house with me. 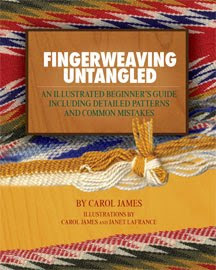 A recent e-newsletter from the Victoria Handweavers and Spinners Guild alerted me to a neat book on finger weaving! I had previously done a post on the historical details of the traditional finger woven sashes of the early French Canadian settlers (here's the link to the older post). I seem to get a lot of people stopping by at my blog researching this technique or looking for a sash. ( I get to see their search engine question or where they land on the blog). I have been emailing with the books author Carol James, aka "Sash Weaver", and my copy of her book is coming to me in the mail! 'Fingerweaving Untangled' is a 64 page, full color, soft cover book that teaches the basics of the technique of 'ceinture fleche'. Based on 'handouts' for a weaving course, it was honed by honest students who did NOT take to fingerweaving easily, and who shared their mistakes and difficulties with the author. This is the only book on the subject written in English by a Canadian. It has been translated into French. Le Fleche Demele is available from the author and from Renaud Bray in Quebec. The Festival du Voyageur is just under way in Winnipeg, Manitoba right now and if you visit Carol's blog, she is featuring pictures of the festival. They definitely have more snow and colder than us here with the 2010 Winter Olympics! 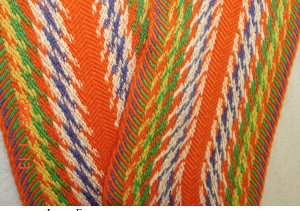 This picture above is of a loom woven sash. This picture is of a finger manipulated/ woven sash and you can clearly see the 'arrow' or fleche! A big thank you to Carol for sending me these pictures to use here. I would invite you to browse Carol's web page for more information and she also keeps a blog. I have linked to hers under my blog list. All questions and further information concerning her book and how to order is covered at her page. Carol's web page/ blog is a great place to spend some time and browse. I'm sure sorry to have missed the class she held in Victoria... but I most likely couldn't go this time anyhow. I'll have to study my book closely and do some homework. Not sure what I will be blogging about next time...might have to start showing you the renovation as weaving has been pretty sparse around here! These images are for Lynnette... I promised to show them to her to prove I'm not kidding about spring being here. We are experiencing the warmest winter in recorded history. From the newscast reports of the snow fall in Washington, D.C. being five times the normal recorded snow fall, I think we can all agree that we are now in uncharted territory! This one is for Dorothy. Its our lightest coloured heather, a soft pink. If anyone knows the name of the shrub that produces these little perky blossoms, please let me know! This is Pieris Japonica (aka lily-of-the-valley shrub) with a nice display! New leaves come in salmon pink and turn green slowly over late spring to early summer. Then one of the true signs of spring... a crocus. Early returning hummingbirds can feed here... quince blossoms are budding up! I normally think of winter as 'prime' weaving weather and this time last year I had a great start on the inventory box. This year? Not so much. 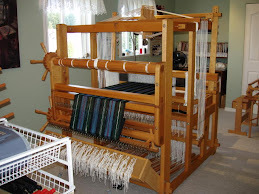 I'm finding that the renovation disruption and a chaotic home is not conducive to feeling connected to the loom and projects. Granted, since I reached a 'certain age', being able to mentally focus some days can be a challenge all in its self! This past week ended with my old kitchen being ripped out and right now we're somehow managing to make coffee in the morning, the toaster is set up in the bedroom and we dine out nightly. Since there's no sink anymore, I wash up dishes in the bathroom sink. Rustic is a good word to describe our situation. Since the work upstairs can get noisy, I plug into my iPod and I'm enjoying various podcasts, avariety of music, and I have downloaded my first digital books. The current 2/8 cotton towel project on Emmatrude, previously described in my last post, is under way and the treadling is blissfully simple: one through to ten and back again. Another variation is simple one to ten and repeat. Not complicated and that's a good thing! I'm not doing contrasting borders as the pattern and stripes are busy enough, so my challenge is to find good weft colours to coordinate with my warp stripes of plum, moss green, salmon pink, melon and taupe. Yup, I forgot to take the apron rod over the knee beam. I had the warp all nicely tensioned and good to go too! Blogger is turning pictures again so just imagine them as vertical stripes! The dark weft is a slightly lighter moss green than the stripe green and it really shows the pattern in the stripe boldly. The lighter weft is a pale pumpkin and it really mutes the entire pattern. There are some weft pics that look like a double weft throws but there is a subtle difference between them. It appears to disapear with the dark weft. One of those neat optical effects! Last time I wove towels in this pattern, the most popular were the ones woven with a dark royal blue. One commenter said they looked like fun peasant ribbons! Here's a shot of the moss green under way. I've used the same plum as in the warp as weft and have tried a neutral taupe as well as the pale pumpkin. I'll rummage through the stash for some other options. I've enlarged and framed the hearts that are back to back and below is the neutral beige for a softer look. I'll only do one as I prefer the effect of darker wefts. It's gone all quiet upstairs so they've gone for lunch... time to make a dash for my fridge or I'll not get a snack till supper! I'll leave you with a picture of my guest room. Yes, there is a bed under there, somewhere... and a floor too. Note the (rapidly aging) Christmas shortbread tin is within reach as emergency rations! Its a dirty job but....someone's gotta do it! Edit: I have photographed the paper draft I have here and dropped it here for those inquiring about the pattern. This was created by Laurie Autio for a compilation CD for Complex Weavers.